Galway senior hurlers relinquished their league title when they were edged out of the league quarter-finals by home side Wexford on a scoreline of 1-23 to 0-23 last weekend. The Slaneysiders will now face Kilkenny in the league semi-finals on Sunday in Innovate Wexford Park while Galway will not be in competitive action until the weekend of May 12/13 when they face Offaly in the Leinster championship in Tullamore. 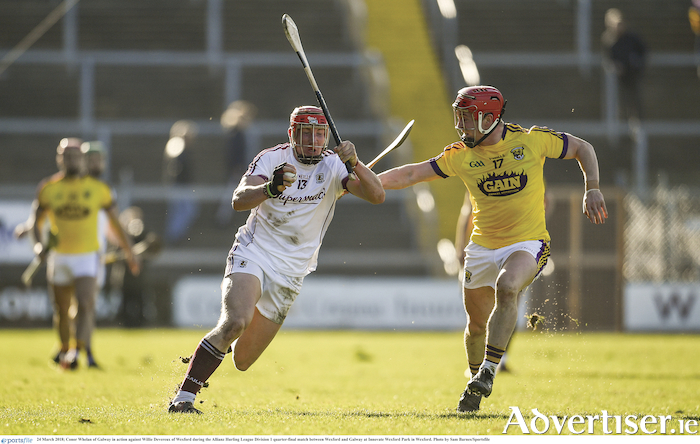 Galway played well at times in the defeat last Saturday, but they were hurling in fits and starts. Wexford seemed fitter and sharper than the All-Ireland champions at stages, and they led by 1-09 to 0-11 at half-time. Galway as they did many times last year in the championship, failed to raise a green flag, and that is something that needs work for the upcoming Leinster championship. A straight red card for Castlegar's Jack Coyne in the second half swung the advantage Wexford's way as it allowed them to play an extra-sweeper at the back and cut off any avenues to goal for the Galway forwards. A big plus for Galway was that Conor Whelan was back to form and the 2017 All-Star notched 0-5 from play in an accomplished display. Had Galway been a bit more efficient in front of goals in the second half - they hit seven wides - they could have pushed the game out to extra-time. However Wexford deserved their victory. The Galway defence was a bit loose at times too, and Wexford did find a few gaps. Galway will have Daithí Burke to come back into the full-back line for the championship and the triple All-Star will close a gap in there, and hopefully last year's goalkeeper Colm Callanan will also be back in the reckoning and will be pushing for a starting slot. Wexford have been working hard on their game over the past few years and Galway will find it very tough down in Innovate Wexford Park in the championship. They are due to face the Model county in the Leinster championship over the Bank Holiday weekend in June. While team manager Micheál Donoghue was disappointed with the loss, he was pleased with the work-rate and commitment his players showed. "The lads showed a lot of character and they worked very hard," he said. "We are disappointed to exit the league at this stage, however we will take a lot from the game. "There were a good few positives. The lads created a few goal chances and that is something we will be working on over the coming weeks. It was good to play Wexford down there and we will be back there again in the championship and we will see how that goes. "For now, we will be back to training hard for the championship and the lads will have a few club games coming up too, and we will just get back to doing what has to be done."